Isn't this red white and blue quilt a beauty? 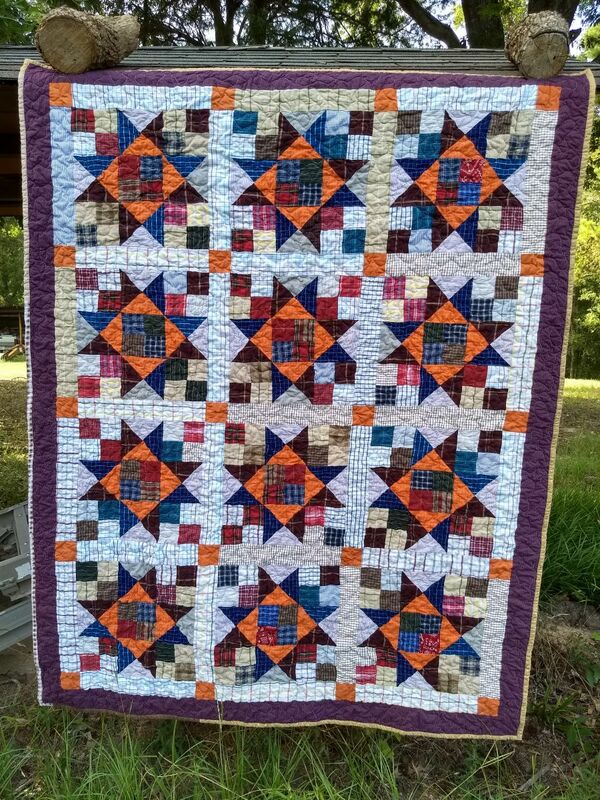 Christy sent in the top for Covered in Love and I quilted it. It's a generous size, something like 60"x85". 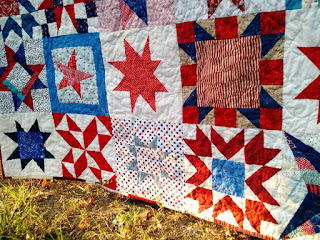 Perfect timing with the red white and blue stars block drive going on right now. 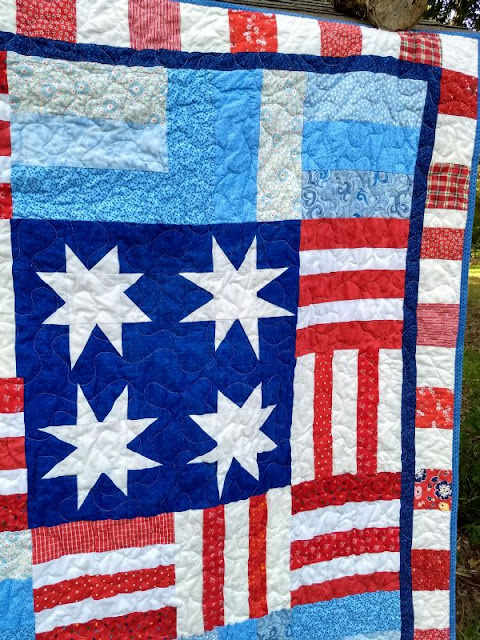 We always have veterans in the hospital whose families are especially thrilled to receive patriotic quilts. 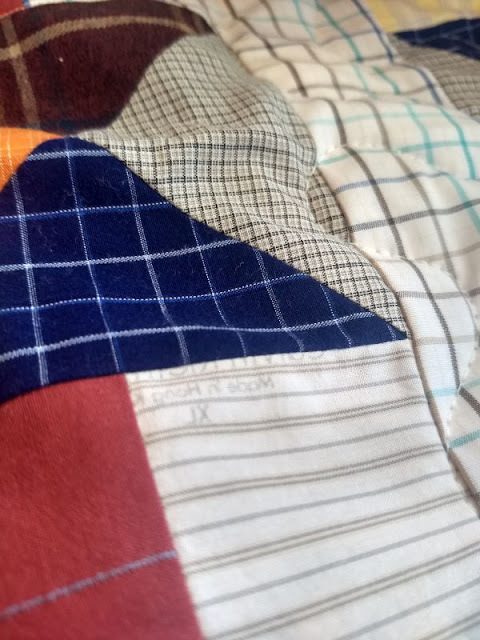 Christy also sent in this smaller quilt made from shirtings that I like ever better. Great masculine colors in all kinds of stripes and plaids. I spotted this recently removed button and part of a label as I was quilting it. How wonderful is that? 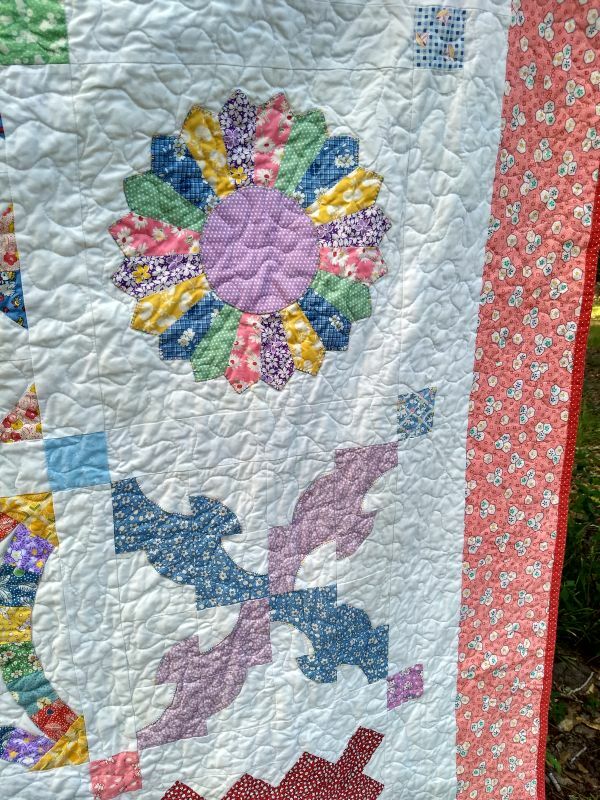 Michele also sent in a top for CiL, this one a sampler with vintage reproduction fabrics. 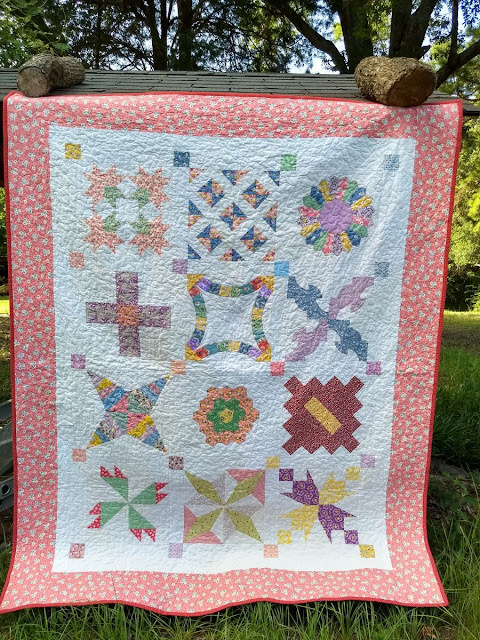 The fabrics are cute and happy looking and I especially like all the different block designs. Beautiful quilts that will bring comfort to patients and families. Thank you ladies! Those are ALL great quilts!! Anyone who wants to make that first one can still find it at QuiltyGirl (https://www.craftsy.com/profile/quiltygirl) on Craftsy. 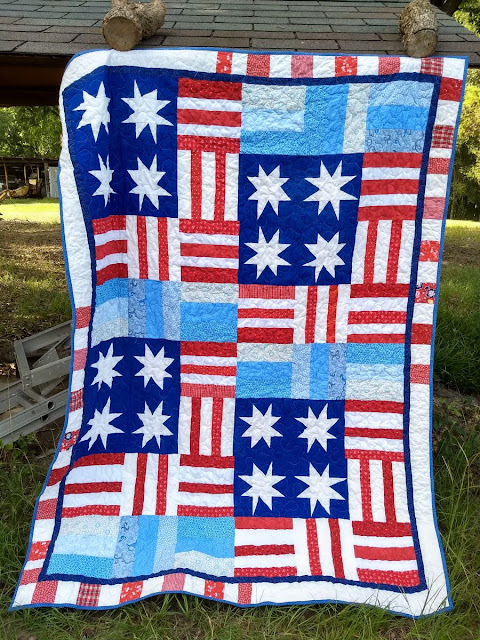 It's called The Patriot and AlyciaQuils offered earlier this year as a QOV Mystery Quilt. Wow - her Patriot looks great!!! 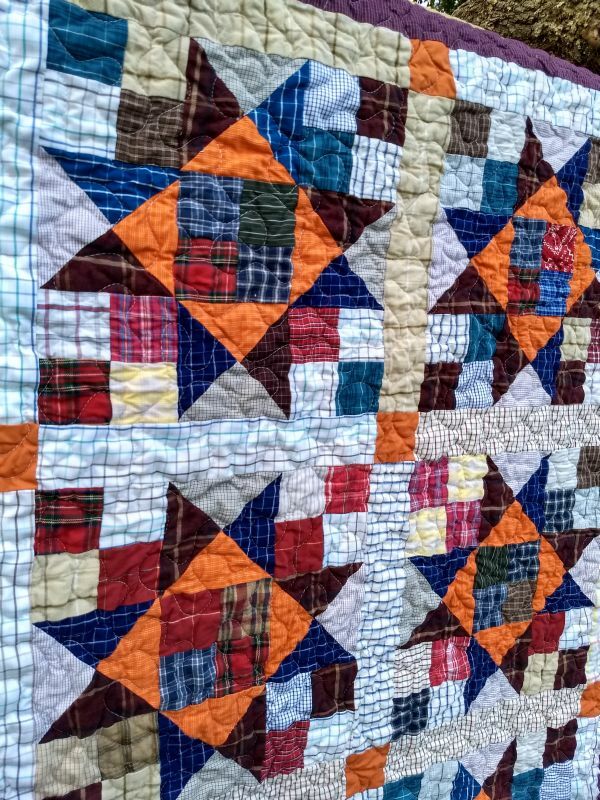 Love all the quilts today!! so pretty! They are are really gorgeous quilts. 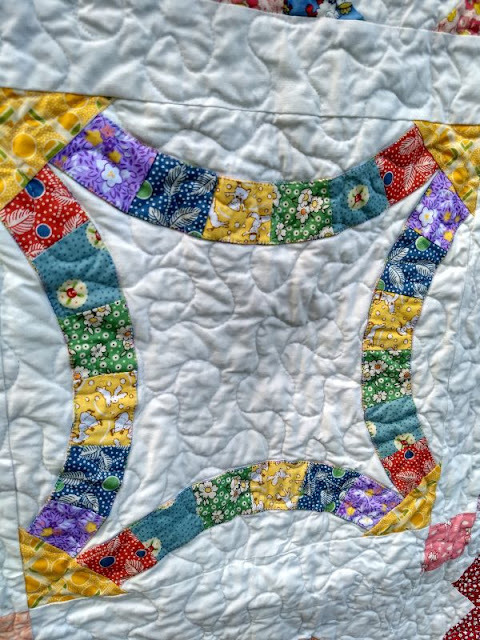 So many quilters are so generous and willing to help the cause. They are all just wonderful! I agree with Danice, Quilters sure can be generous! I can barely get my own quilts finished! Someone’s. Always getting married, or having health concerns, etc. I’m a pokey maker! Gorgeous donations! Many thanks to Christy and Michele! All these quilts will be so gratefully received by the families. Just beautiful quilts for families in need of some love & support. It's hard to decide which one I like the best. I'm really drawn to the one made from shirts. Thanks Kat, Christy & Michele for bringing together 3 more quilts for the cause. "Many hands make light work". Those are ALL wonderful quilts! I think the shirting one is my favorite too. Beautiful quilts for a very comforting cause. They're each so unique. So many great finishes.